One could hardly accuse David Hockney of being trendy. For decades he has marched resolutely out of sync with artworld fads. Yes, somehow, with the death of Lucian Freud, he has managed to secure the reputation as Britain's best painter. Does he deserve that title? 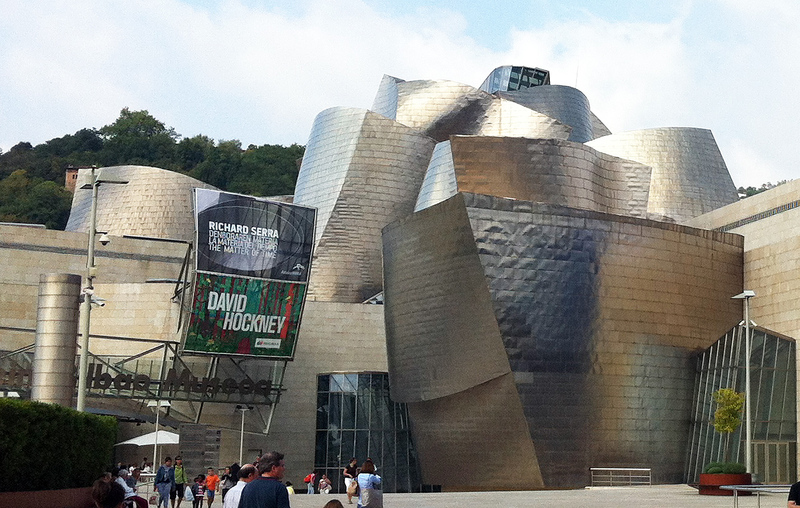 His latest show, at the Guggenheim in Bilbao, provides an opportunity to reflect on that question. The show consists of a vast collection of large landscape paintings, many garishly colored, some with multiple panels, all created with humbling competence in a startlingly short period of time (in two years, Hockney produced enough of these to fill a small museum). Stylistically, they evoke Phillip Guston, Maurice de Vlaminck, and even Henri Rousseau. They are bold, illustrational, spontaneous, often cartoonish, even kitsch and faintly sentimental. This is Yorkshire, Britain's oh so lovely countryside, charming and domesticated. Hockney's paintings are far too masterful to dismissed as shopping mall art, but one wonders whether they is any whiff of irony in them. They present nature with such earnest delight that one sometimes gets the impression that we are seeing the outpourings of a mall artist who rubbed a genie's bottle and ask for talent. Despite their frequent allusions to work in the history of art, their sensibility brings them dangerously close to the art that "decorates" hotel rooms. In a word, Hockney is tasteless. In the past, he has given us countless swimming pool paintings, still-life sketches drawn on an iPad, and a photo shoot of Grand Canyon. The latter was impressive, because he assembled dozens of snap shots to create views of the canyon that are large enough to given one a sense of being there. 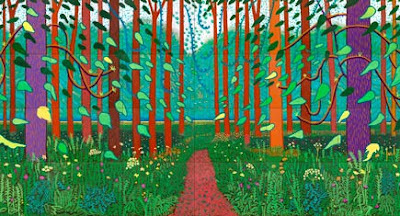 Hockney's multi-panel paintings in the Bilbao show recall some of those earlier efforts, but unlike the photographs, which take on a cubist feel, the neatly assembled canvases serve only to make Hockney's landscapes bigger, rather than more interesting. The show s called, "A Bigger Picture" and one gets the impression that Hockney is trying to push scale and volume to advertise his virtuosity, rather than to make any particular artistic point. That said, the show works best when seen as a single piece, rather than a collection of individual paintings. So conceived, it becomes an immersive installation that brings the viewer into the wilds of Yorkshire, a technicolor wilderness that looks like it has been painted by a post-impressionist smurf. Perhaps this way of viewing the show--as an immersive experience--works best because it restores something some profoundly absent in Hockney's landscapes: a sense of mystery or danger. So many of the great landscape painters of the past deliver a view of the natural world as threatening. Consider Friedrich, Rubens, Turner, or Hercles Segers, who was celebrated by Werner Herzog at this year's Whitney Biennial. In the twentieth century, one might add Tanguy, Kiefer, or the landscapes of Schiele. For all these artists, nature is always threatening to consume us. This is equally true for Rousseau, who seems to be an influence on Hockney here. But Hockey apes Rousseau's naive attention to detail, while filtering out his claustrophobic exoticism. Perhaps Hockney's landscapes are best seen as a continuation of the impressionist cannon, but there at least we can discern an experiment at work; impressionist may err in the direction of the pretty, but they also tell us something about seeing and painting. Hockney's work may tell us something about painting too, but the lessons seem old and familiar. 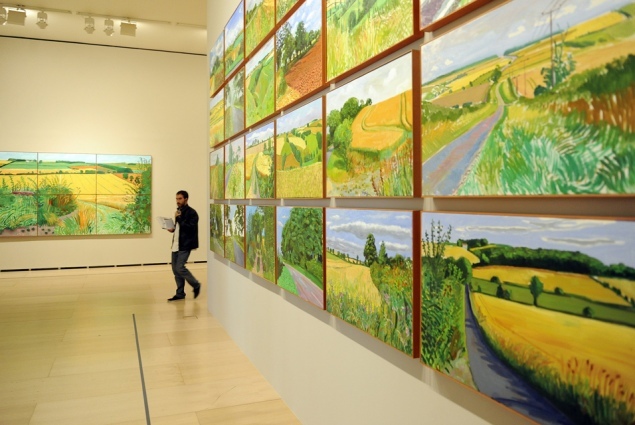 Far from teaching us something new, Hockney seems to mock viewers with his refusal to innovate. Some might find that refreshing. If Hockney is not the greatest living British painter, who is? I await your nominations. I look forward to seeing his next exhibit: Hockney's Paint by Numbers. Only then will he rival Damien Hirst. 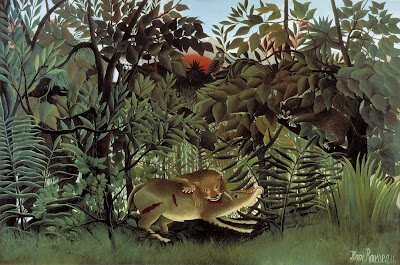 I like Rousseau. I was very impressed when I first found Rousseau paintings, I had an instant reaction. but many say that now art is more intellectual than before or used to be. in other words, that now you really have to read a lot to "get it". so some people think Hockney is good whereas others think he is not? to these extremes? it does not seem quite normal though.